HealthAlliance of the Hudson Valley recently announced that it will upgrade its existing electronic health record (EHR) technology systems as part of its focus on enhancing healthcare quality and safety for the communities it serves in upstate New York. Headquartered in Kingston, N.Y., the three-hospital system plans to expand its relationship with McKesson by implementing Horizon Clinicals® solutions for use by approximately 750 caregivers system-wide. HealthAlliance already uses McKesson’s medical imaging, pharmacy and automation technology as well as its pharmacy distribution services. The new clinical upgrade should help position the health system to qualify for HITECH incentives under the American Recovery and Reinvestment Act (ARRA). HealthAlliance is turning to McKesson’s Web-based portal to provide its care teams with increased – and secure – access to patient data. Whether physicians are inside the hospital, at the office or at home, they will be able to log on to the system and review patient information. As a result, they will be better equipped to make informed decisions for their patients – even after-hours. With the technology upgrade, all clinicians will have electronic access to information about patients’ active health problems, past diagnoses, medication history and known or reported allergies. Nurses will document care in the EHR at the bedside, providing immediate updates to other clinicians. A new electronic tracking board also will provide teams with at-a-glance information on patient status, including clinical, admission/discharge/transfer (ADT), environmental services and more. It displays that information against hospital floor plans on large, electronic whiteboards. In addition, the health system plans to implement new solutions to advance patient safety. Bar-code scanning technology will enable nurses to electronically verify the “five rights” of medication safety at the bedside – right patient, right drug, right dose, right time and right route. Before giving a medication, nurses will use a handheld device to scan their own employee ID, the medication and the patient’s wristband. The device will notify the nurse if one of the five rights isn’t met, prompting a check of the patient’s chart and the doctor’s order. Plans also call for HealthAlliance physicians to deploy a computerized physician order entry system (CPOE). CPOE enables physician orders – whether for medications, lab tests, or imaging studies – to be submitted electronically, more effectively and efficiently than with a paper-based system. HealthAlliance of the Hudson Valley is the alignment of The Kingston Hospital, Benedictine Hospital, Margaretville Hospital, Mountainside Residential Care Center and Woodland Pond. The goal of HealthAlliance is to strengthen the quality of care, bring forward enhanced technology and provide compassionate care to serve the present and future healthcare needs in the Hudson Valley. McKesson Corporation, currently ranked 14th on the FORTUNE 500, is a healthcare services and information technology company dedicated to helping its customers deliver high-quality healthcare by reducing costs, streamlining processes, and improving the quality and safety of patient care. 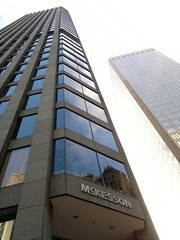 Over the course of its 177-year history, McKesson has grown by providing pharmaceutical and medical-surgical supply management across the spectrum of care; healthcare information technology for hospitals, physicians, homecare and payors; hospital and retail pharmacy automation; and services for manufacturers and payors designed to improve outcomes for patients. For more information, visit http://www.mckesson.com. McKesson today announced that three more community hospitals have chosen the company’s Practice Partner® Patient Records electronic health record (EHR) and practice management solution for their employed/affiliated physicians. The hospitals, which also selected the Paragon® hospital information system (HIS) to automate care processes in their inpatient settings, aim to enhance communication and care coordination among healthcare providers in their communities. The new practices implementing the solution will join more than 100,000 physicians already using McKesson physician solutions nationwide. The latest hospitals to contract for the solutions include Davis County Hospital, located in Bloomfield, Iowa; Paynesville Area Hospital, located in Paynesville, Minn.; and Renville County Hospital and Clinics, located in Olivia, Minn. Through tight integration, McKesson’s Paragon HIS and Practice Partner EHR/practice management system offer a winning combination for communities looking to take the next step in care collaboration by connecting the inpatient and ambulatory settings. In the Practice Partner EHR, Bright Note Technology™ automatically populates critical data on a patient chart. This enables physicians and other providers to use their preferred charting style to capture data in a single screen note and synchronize searchable data across the complete chart. The Practice Partner solution is part of McKesson’s full suite of solutions designed to help physicians improve patient care. McKesson’s offerings also include business management and revenue management systems, connectivity platforms for health information exchange, and medical-surgical equipment and supplies. Paragon is specifically designed to address the unique needs of a community hospital. The HIS integrates critical financial and clinical solutions on a single platform. Those benefits translate into reduced training time for staff, enhanced data management and ease of deployment. The solution recently achieved the “Best in KLAS” ranking for Community HIS in the 2009 Top 20 Best in KLAS Awards: Software & Professional Services report for the fourth consecutive year. Facing the same meaningful use deadlines as larger organizations but with only a few viable vendor options, critical access hospitals are eager for more IT power, according to a report from KLAS. The new report, “Closing the IT Gap: Critical Access to 50 Bed Hospitals”, highlights the experiences of more than 300 healthcare professionals at hospitals with 50 or fewer beds. Providers at these critical access facilities generally reported an appetite for software capability that exceeds vendors’ ability to deliver, particularly in areas like computerized physician order entry (CPOE). Only a handful of electronic medical record (EMR) vendors specifically serve the critical access market, with CPSI, Healthland and HMS enjoying the most market share. Of those companies, Healthland received the highest performance rating in the KLAS report, but none of the vendors’ solutions earned high marks for adequate functionality. “Among the three vendors rated in the report, Healthland’s EMR solution earned the highest score for having the needed functionality,” said Paul Pitcher, KLAS research director and author of the new report. “But that score was still relatively low, with only 55 percent of customers satisfied. “In addition, for all of the rated products, only about 50 percent of the provider comments regarding functionality and upgrades were positive, suggesting significant gaps with the current offerings,” Pitcher said. One of the foremost pieces of missing functionality, particularly in light of impending meaningful use requirements, is CPOE. The KLAS report notes that CPSI is by far the leader in delivering CPOE to critical access hospitals, with 17 live organizations that are likely to be the most ready for meaningful use. In general, however, CPOE adoption is limited and shallow in this space, with a total of only 21 critical access hospitals known to be live on CPOE. Beyond the three leading vendors, a few companies that have traditionally served larger community hospitals are also having some impact among facilities with 50 or fewer beds. McKesson Paragon is increasingly being considered by hospital executives in smaller spaces, and QuadraMed has a few Affinity clients, most of which are financial customers, in critical access hospitals. Although Meditech is known as a community hospital vendor, the cost of the Meditech EMR prevents the smallest hospitals from seriously considering it. To learn more about the EMR software market at hospitals with 50 or fewer beds, as well as the strengths and weaknesses of participating vendors, the report “Closing the IT Gap: Critical Access to 50 Bed Hospitals” is available to healthcare providers online for a significant discount off the standard retail price. To purchase the full report, healthcare providers and vendors can visit www.KLASresearch.com. Five healthcare organizations are recipients of McKesson’s 2009 VIP Award for their accomplishments in using healthcare information technology (IT) to improve quality, safety and efficiency. The winning organizations achieved significant results in a variety of areas, including medication and laboratory safety, use of electronic health records (EHRs), care team connectivity across facilities and states, and smoker cessation. Now in its ninth year, McKesson’s annual VIP Award recognizes organizations that demonstrate vision and innovation in the use of IT to improve healthcare performance. Each winning organization also receives a $10,000 grant for its foundation or charity of choice. Today McKesson announced the availability of Medisoft® v15, the latest version of its industry-leading practice management (PM) solution used by more than 70,000 providers in small physician offices. With the new release, McKesson also announced the availability of Medisoft Clinical, which combines the PM capabilities of Medisoft v15 with the company’s Practice Partner Patient Records, a CCHIT Certified® 08 Ambulatory electronic health record (EHR) . The result is a single PM/EHR solution for small physician offices that are focused on delivering the highest quality to their patients at an affordable price.